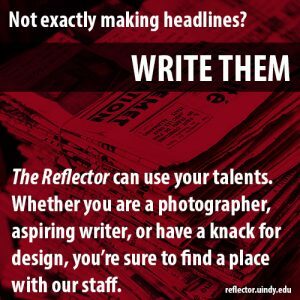 This season, two University of Indianapolis basketball players have worked their way into the record books by both attaining 1,000 career points. Senior guard CJ Hardaway achieved his accolade in a loss to Lewis University on Dec. 1. 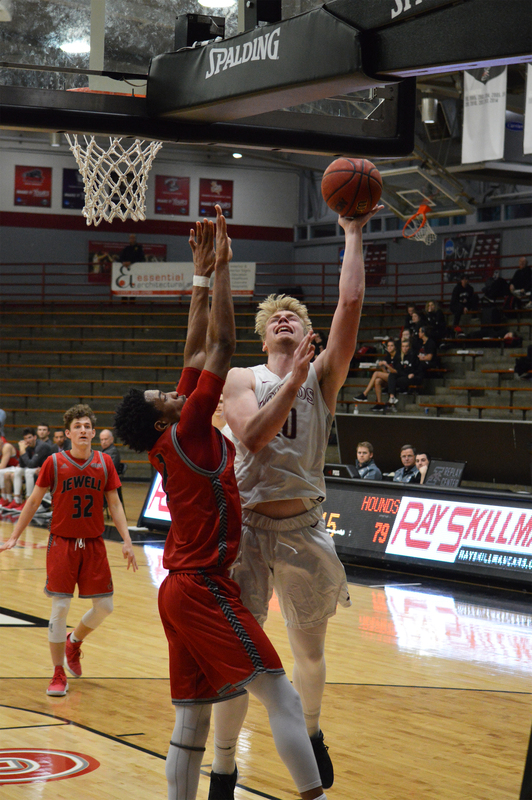 Senior center Jesse Kempson achieved his accolade on Jan. 10 in a 71-70 win against the Drury University Panthers. Head Men’s Basketball Coach Stan Gouard said he was happy to be there with them for this achievement. 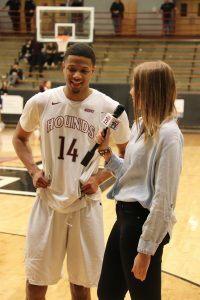 After an intense and close game against Rockhurst University, CJ Hardaway was interviewed by UIndy TV 5 after his fade away, buzzer beater, that won the game. Kempson’s success with the Hounds system helped him to earn the place of the 41st player in UIndy history to attain career 1000 points. 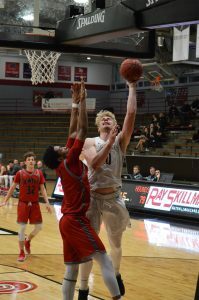 Kempson is UIndy’s stat leader points, rebounds and blocks. Kempson went from averaging 3.3 points to as a senior averaging 15.1 points per game. Kempson attributes his success and growth to his teammates who help him get started early in the game. The Hounds run a traditional style offense when Kempson is on the floor, according to Gouard, which means feeding the post and letting the centers score. However, when Kempson is off of the court the team is forced to play faster and that is when having two high scoring players, like Hardaway and Kempson helps the team. This is the strategy that Gouard implemented when Kempson got into foul trouble early into the game against Rockhurst. Center Jesse Kempson goes for a shot after getting fouled. Kempson earned his fourth double-double of the season against William Jewel Cardinals on Jan. 26. Hardaway’s accomplishment of 1,000 is more complicated than Kempson’s. 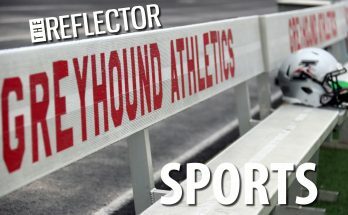 Hardaway transferred to UIndy after St. Joseph’s College closed. There he recorded 672 of his 1,000 career points and averaged 14.3 points. 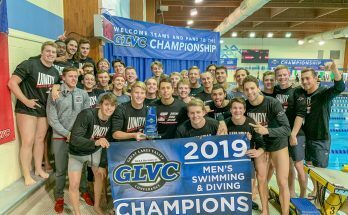 According to Hardaway, UIndy was an easy choice because it has a community that welcomed him in. 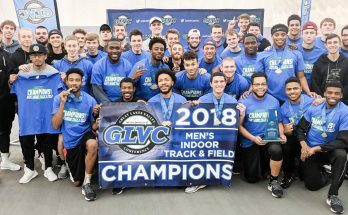 Gouard stated that individual accolades have not been the focus for these two. Gouard and Hardaway both said the goal is to make a run towards a national championship in March.